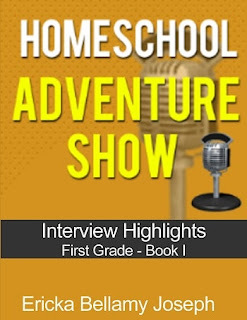 Today we are interviewing Ericka Bellamy Joseph, author of the non-fiction/education book "Homeschool Adventure Show: Interview Highlights –First Grade Book 1." I am a retired U.S. Marine of over 20 years. I am the Founder/CEO of Plan2Win, Solutions, LLC. I am an Online Entrepreneur and currently a Homeschool Mom. What I do best is consolidate information in simple and easy to follow formats. "When I retired from the military, I had two dreams-homeschool my child and work for myself. It started with me writing the books floating in my brain and it has blossomed into much more." When did you first get interested in homeschooling? I decided to Homeschool after completing my college Thesis paper about Alternative Education. That was before I was married and pregnant. Tell us about your book for homeschoolers. This book is an entertaining look into the life of a homeschool child. My daughter and I created a Homeschool podcast on BlogTalk Radio (Homeschool Adventure Show). By popular demand, I have transcribed the interview show notes. I will provide you a glimpse into my daughter’s journey as she learns Spelling, Reading, Math, Science, History, Geography and much, much more. It will benefit those currently homeschooling by providing a dose of humor and a little encouragement. It will be an introduction of the work involved for those thinking about homeschooling. What inspired you to create a book featuring interviews from your homeschool podcast? I was asked by several people if I could put the podcast shows notes in Kindle format. Do you have a favorite interview from your book? When you conduct an interview, do you go into it with a set of questions? Or do you allow the conversation to go where it needs to go? The interviews do have some structure to keep us on track within our allotted time, but there is also time for free-flow. It seems like there have been a lot of changes in education in the past decade. Do you think interest in homeschooling is growing? I do, there are a number of groups here in my local area and the conventions pack a large crowd. Homeschooling is hard work, but it is also very rewarding. If the book is popular as determined by downloads and reviews then I will most likely launch a book two. The book will have its first promotion launch period July 14 through July 26 2015.